My interest in dingoes first stemmed when I was working on a mine site in central Australia, there was a pack of dingoes who lived amongst the dongas, scavenging food from the bins and scraps accidently dropped by the miners. Every morning at dawn they would call each other from various parts of the camp in a harmonious howl, greeting the day in unison. While working in Broome a few years later, an opportunity arose to adopt a wild born Pilbara dingo, Tanami through rescue group SAFE. There was a brindle medium cross bred female dog named Tye, who got along with him at the shelter they asked if I could foster over the Christmas period, 2 rescues under 6 months and one of those a dingo..how hard could it be? My grandparents had a dingo on their farm in early years, this was meant to be. What a fool I was. Dingo pups are chaotic, he was into everything, he ate the retic watering system, he could open sliding doors and fridges, he chewed everything, he was so naughty. He ripped clothes off the line, he opened gates and went on adventures, he dug holes he destroyed furniture,he would sneak up behind me and nip my bottom or heals ripping small holes in my clothes and leaving bruises on my skin,I didn’t have a clue what I was getting myself into. I contacted the western Australia dingo association who soon became my mentors in all things dingo, they eased my tears and fears. I booked them both in to weekly dog training social classes, I wasn’t going to admit defeat, surely this behaviour could be adjusted. Tanami would learn in class by watching the others, when he was in the mood he excelled at training, but I soon learnt about training a dingo, don’t expect it to be reliable, its on their terms. My nan became ill so we moved back to NSW, Tye was getting stronger and Tanami had predisposed traits, they began to fight, their fights soon became serious, when I got a nasty redirection injury while trying to separate them I knew I had to do more about this situation. I enrolled in the NDTF. Tanami got his own day enclosure which took the pressure off leaving them alone during the day without incident. Tanami to this day still takes clothes off the line, steals and buries anything of value left accessible in the yard, he is affectionate, intelligent, cheeky, loving, wary of strangers and routine, but happy to go for a walk in new environments on lead. Every morning he participates in his own morning howl ritual with the resident german shepherd. We are always, and I stress always, on guard about ways he can escape, a loose dingo on the streets is not something we want to deal with, he may or may not come home, depending on if he gets distracted, living rural we worry about how the public would react to a loose dingo in the neighbourhood and we worry about his safety. We spent a lot of time and money ensuring the yard is escape proof, we added an enclosure for extra security and he is crated at night. He spends his day digging, sunbaking and watching the world go by on the top of his cubby house. 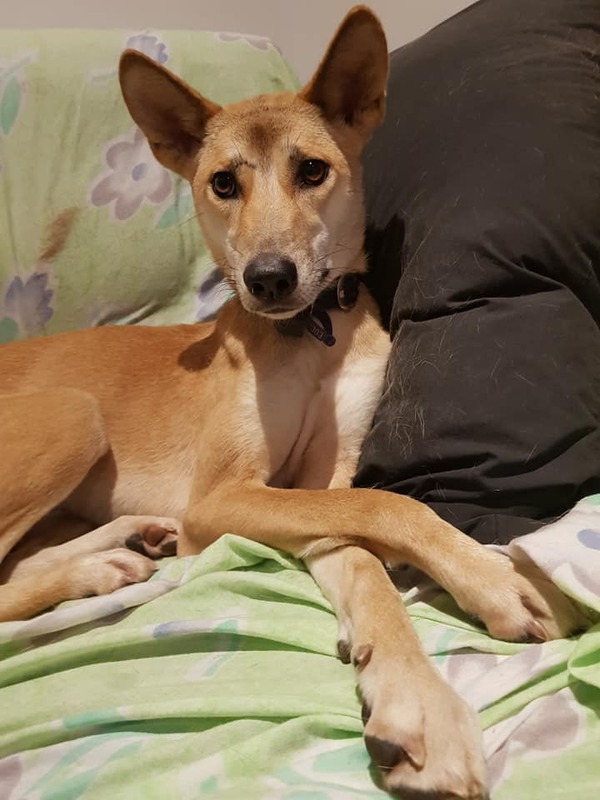 In reality Tanami spoilt me into thinking all dingoes were like him, we had survived the naughty curious puppy stage, overall he was a confident character that was adaptable. Along came Poppy, wild born who was allowed to free roam on a property as a young pup, she ate with the property dogs, bull arabs and dachshunds. The owner was moving and couldn’t take her with him, he didn’t want to leave her on the property as he was concerned about her future. 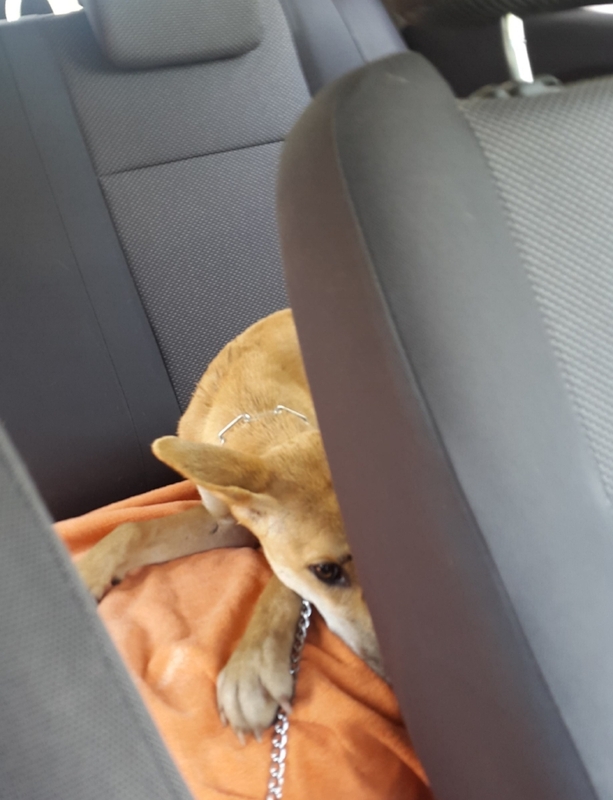 Took 3 days to catch her, she had never been in a car, she was scared, very very scared. It took 6 months of going to doggy day care every single day, her hiding at the back of a crate watching the other dogs and world pass by, she finally picked up a toy. One Saturday afternoon when all the boarding dogs were away, she was out in a yard with Astro and Max, she picked up the toy and she ran around the yard with it. The same week she initiated contact with dogs through the wire fence, we were soon able to trial her with different dogs weekly, she can read dogs well and was able to help the nervous new dogs and she was also able to play with the boisterous as she could downplay situations easily. She was always fine with Max and Astro at home and they played a massive part to her confidence and trust building at home. The first few months at home outside she spent the entire time trying to escape through the fences, I would be often up and down up to 5 times a night, trying to get her to toilet, any change to the environment, including the neighbour 2 acres away coughing would scare her and we would have to go inside and start again at another time. She still occasionally loses her bowels in new environments, vet visits etc but she is getting better, socializing at day care I saw her at her best, she was happy confident and loved the company of her own. I knew I couldn’t give up on her as she has so much personality but not the confidence to show it. She is extremely human wary and even seeing the same staff every day, I was the only one who could touch or move her. When she is scared she flattens herself, goes stiff and toilets. These moments don’t happen as often as they once did, and I hope in time we can reduce them even more. She is curious, and intelligent, she is sensitive, I have to consciously be aware of even my own body language, clothing and mood before I try to do anything with her. No day is the same with Poppy, I cannot predict her outcomes, as each day can change depending on environment, weather, neighbours noise, her mood, anything. Each day we do have little wins and I appreciate them for all their worth, I respect her limits and patiently help her in her journey to grow with confidence, together we both learn. Dingoes are hard work, keeping them safe and secure costs money, going on holidays and leaving them somewhere just as safe and secure can be stressful. Both dingoes have changed my life, they have taught me patience, they require time, security and sensitivity that immerses into your entire lifestyle. I wouldn’t recommend a dingo to an every day pet dog home, I made that mistake but I had to quickly step up. I have learnt some valuable life lessons the past few years, learnt about myself and the dingo, I’ve been humbled, dingoes are amazing animals, adaptable and strong.I look forward to sharing my life journey with them, together we learn. Jess Ward has always had a love of animals, stemmed from an early age regularly visiting her grandparents on their horse riding farm in the hunter valley. Her grandfather, a collector of all things slightly different, Emus, kangaroos, donkeys, the dingo, plus the usual assortment of farm animals Since Moving to the Northern Territory in 2003 Jess has kept reptiles , from shingleback lizards to multiple snakes. She has had a few animal related jobs over the years, in between working FIFO and tourism, from working in a petshop, vet clinic, Accell therapy consultant and most recently at a boarding kennel and doggy day care facility. Besides Poppy, she also has Max a loyal , quirky Malinois and Alfie a Staffy cross, last year she lost her favourite little 13yr old travel companion Astro, cattle dog x to a spleen mass. Jess plans to continue her dog training skills and knowledge and has some upcoming goals and seminars to coincide with this. Always learning always growing.